TITUSVILLE, Fla. - March 25, 2013 - PRLog -- MADART ~ "Art that Colors the Soul"™ is the studio name for licensed artist Megan Aroon Duncanson. 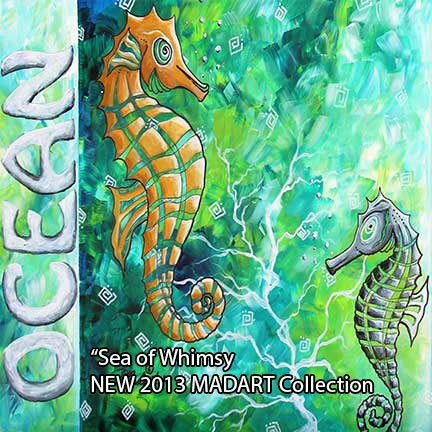 2012 was a banner year for MADART™ with nine new licensing agreements added to the already expanding products featuring the contemporary, colorful and whimsical art Megan creates. Several new licensing agreements in 2012 included "Arte Fx Decor" for prints, "Funky Celebrations" for greeting cards and gifts and "Uptown Art" for Studio Classes. 2013 looks to be an even more promising year for the MADART™ licensing brand with three new licensing deals already having transpired as of March. "Dianoche Designs" is now creating illuminated wall art with numerous MADART™ designs and "Check Advantage" is producing checks, checkbook covers and address labels with 12 collections featuring MADART's™ work. The most recent licensing deal is with "Wear that Art" for t-shirts. About MADART™ ~ Megan Aroon Duncanson: "Megan Aroon Duncanson (MADART™) has a distinct flair for modern/contemporary art. Her style and use of color are unmistakable, and her use of bright, rich, saturated color and abstract composition draw the viewer in for a long-lasting enriching experience with “Art that Colors the Soul”". Megan's life growing up in the bush of Alaska and currently splitting time between the shores of Florida and Alaska contribute to her inspiration for coastal and tropical designs prominently seen throughout much of her art.